The new, ambitious building for the Energy Academy Europe promises to become the most sustainable education building of the Netherlands. It is a new top institute in which industry, education and academia are joining forces to work together on research and innovation in the field of energy. To achieve the extremely sustainable energy principles, the building has been given a particular design with a large solar roof. The construction of almost 15.000 m2 with BREEAM-rating ‘Outstanding’ will be realised in 2015-2016 on the Zernike Campus Groningen. The new building is designed to inspire each other, exchange ideas, be innovative and to generate energy. The unique design demonstrates how a building can make optimal use of the natural elements earth, water, air and sunlight as a primary source of energy. The sloping roof with solar panels will be optimally applied to collect solar energy. The solar panels not only provide a lot of energy, but they also ensure maximum natural lighting . This outer layer gives the building a unique and characteristic appearance, drawing attention to the innovative energy management going on inside the building. Roughly speaking, the building will comprise two sections. 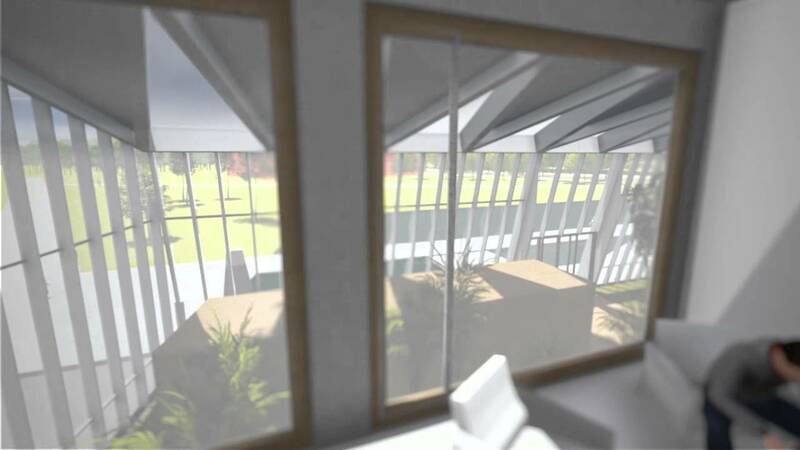 On the north side will be the research areas with laboratories and related workspaces, and on the south side the workspaces , a winter garden and the teaching areas. Between them, all worlds come together in a large ‘energy square’, the lively heart of the building. Also the floors, made of natural material, connect all parts of the building. Via wide, attractive stair ramps users and visitors will feel a natural desire to take the stairs rather than the elevator. Exercise and sociability will be encouraged and the elevator will not use unnecessary energy. A large winter garden will serve as an open extension for the rest of the building, but can be closed off if required. The winter garden will be a public place, and a pause and workplace as well. The BREEAM-rating ‘Outstanding’ sets extremely high standards of sustainability and energy consumption in the new building. The building itself will be an example of an inspirational energy regime. The standard is so high that there is no comparable education building in the Netherlands. It sets an example for future building projects all over the world. To achieve this goal, a team of experts is working together consisting of Broekbakema, pvanb architecten, ICS Adviseurs, Arup, Ingenieursbureau Wassenaar and DGMR. The Energy Academy Europe (EAE) in Groningen is the initiative of the University of Groningen, the Hanze University of Applied Sciences, GasTerra and Energy Valley. The key energy themes of the EAE are gas (including biogas and green gas), the energy of tomorrow (such as wind and solar energy), smart grids, energy efficiency, cost savings and CO2 reduction. Last modified: 06 September 2018 11.44 a.m.